Gone are the days where photos are developed and stored in the real world. Many have fond memories of exploring grandparents’ attics and basements, hauling out boxes of old Kodak carousels and century-old photo books. With the evolution to digital photography, most of us don’t bother with printing out each picture. So we fill up our smartphones and digicams with RAW files, jpegs, and videos, maybe-occasionally syncing or sharing them on Facebook/Twitter/Instagram/whatever. The vigilant among us organize every photo from every device, backing them up first to a computer and then to external hard drives. But even that’s not good enough. Hard drives fail. Computers age and corrupt. Houses burn down. No, my friends, the only true way to maintain your digital memories in the modern world is to supplement local file storage with an online system. The great news is that, with the advent of ultra-cheap server farms by companies like Amazon, Photo Storage Services in the Cloud are extremely affordable and easy to use for anyone with a digicam, smartphone, and an internet connection. Many offer a way to save the original, unmodified photo and video files while syncing them between your various devices so you’re never without your memories. While we realize this is a growing market and could feature a dozen more options, we had to narrow the list down to what we see as Best Photo Storage Services in the Cloud. Please note, however, the below pricing information may change at any time, or only be applicable to US readers. If you’re already an Amazon Prime member — a $99/year subscription service that also includes two-day shipping on all orders, film and television streaming content, Kindle books, and music — then Amazon Photos aka Amazon Cloud Drive is a no brainer. You’re already paying for it so why not try it out. For everyone else, it costs less than $1/month to store all of your photos in the cloud. The one drawback is that subscribers can only back up 5GB worth of videos and other files in this first tier. However, if you want to back up EVERYTHING, unlimited cloud storage will set you back an extremely reasonable $59.99. The one catch is that file sizes are limited to 2GB, which would mostly affect longer HD video files. In usage, Amazon Cloud Drive is very simple, which is both good and bad. It’s easy to use, and great to have access to all your photos on all your devices at full resolution, but lacks some fluidity and elegance of other apps. If you own an iPhone, chances are you know Apple iCloud. The last few generations of iOS devices have offered cloud backups (as opposed to syncing via iTunes on a computer) as well as 5GB of free storage. That all remains the same, and is called the Apple iCloud Photo Library, which has been design to seamless integrate with Photos on your smartphone, tablet, iMac, and MacBook. Photo Library works by storing the original, full resolution file in the cloud, while “optimizing” them for storage on your device. In other words, while the full res original file is safe online, you might only see a thumbnail on your phone until you choose to download that photo. Overall, iCloud Photo Library is easy to use, and makes social media sharing a breeze. Plus, even if you don’t have your particular device with you, if you can find an internet connection, iCloud.com will make your files available anywhere, and includes free web versions of their productivity apps, Numbers, Pages, and Keynote. The only real downside is Android or Windows Phone users don’t get their own app. You can still use this service on a Windows PC, but this is essentially a storage option for those who are all Apple, all the time. Mad Men’s Don Draper made the (fictional) pitch of a lifetime for Kodak’s Carousel, but now the brand lives on in the form of Dropbox’s photo storage app. To be clear, you don’t actually need to use this app to make Dropbox store photos. You can backup any type of file you want on Dropbox via its iOS, Android, Mac, or PC apps. The genius here is that Dropbox combines local storage with a syncing service that delivers every file to every computer you own, while making the files individually available on smartphones and tablets. The Carousel Dropbox app adds a cleaner, photo-friendly design for perusing your photos and videos, and for sharing them on social media. Dropbox Basic is a free service and includes 2GB of space for any type of file, but you can perform little tasks — having other friends sign up, purchasing certain electronic devices — to earn more free space. But if you want the full service option, check out Dropbox Pro for less than $10/month for 1TB of storage. Dropbox is less about sharing photos than it is seamlessly integrating them across numerous platforms. The only downside here is that you may have to use “Selective Sync” if any of your computers — say a MacBook Air with a solid state drive — has significantly less storage capacity than the number of files you plan to store in the cloud. It’s not hard, but some folks might miss this feature. First generation Eyefi memory cards (then called Eye-fi) were all about backing up your photos to a local hard drive via a Wi-Fi network. The new cards allow you to not only connect to laptops and desktops with built-in Wi-Fi, but also directly to smartphones and tablets running the compatible Eyefi app. Now, if your DSLR or ILC or point-and-shoot doesn’t have built-in Wi-Fi or if you’re looking to streamline your backup process, it’s easy to transfer files and backup them up on the cloud. Eyefi Cloud is a little different from some of the other services we tested. First, you have to purchase actual hardware in the form of a Mobi or Mobi Pro memory card. With that initial investment of $30-$100, you get a membership with the Eyefi Cloud with unlimited photo storage and syncing between all your devices. These memberships, depending on which Mobi card you buy, will last up to one year. After that expires, the services costs $4.99/month or $49.99/year. The downside here is that, while you can use Eyefi to “transfer” video files (under 2GB), you cannot store any video files in Eyefi Cloud. There’s also some odd language in the fine print about how Eyefi “optimizes” file sizes for certain devices. To be fair, Apple does this too while retaining the original file size in the cloud — I would assume Eyefi does something similar, but I wouldn’t delete anything off the Eyefi card until larger resolution RAW and JPEGs are properly backed up. Facebook is mostly known as a social media hub — for connecting family with friends, for brands to reach out to current and future customers. But it also makes a pretty good secondary file storage system. It’s free, you can upload, essentially, an unlimited number of photos (apparently the cap comes at 1,000 photos per album), and it’s already available to your friends and family to see and enjoy. Also, should you wish to keep some photos private, you can opt for that as well (or maybe you realize friends and family might not want to see all 1,000 photos per album, hehehe). The apps are great and many more high-end cameras are including direct Facebook integration. This is a fun option because Facebook is everywhere. The downside is quality. If you don’t upload a photo with a pixel width of 720, 960, or 2048, Facebook resizes your photo and their compression algorithms aren’t the best, to be honest. Not to mention that the 2048 max width is perfectly fine for sharing on the web, but not a great way to permanently back up priceless memories and/or your latest artistic endeavors. Think of Facebook as a great second or third back up. If everything else goes to hell in a hand basket, at least you’ve got these lower res options. 1TB Flickr Pro: $49.99/year and includes ad-free browsing, visiter statistics, 20% off the Adobe Creative Cloud Photography plan for 1-year, and free shipping. Is it sustainable at this price? 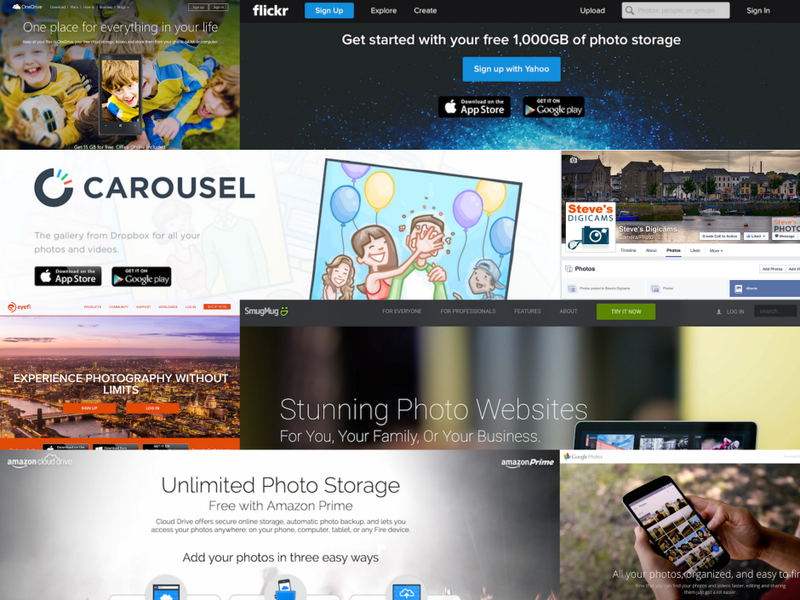 Flickr, now owned by Yahoo, offers the most storage-bang for your buck. Each user is entitled, at no out-of-pocket expense, one full terabyte for photos and videos. Sure, there are some limitations — video playback length is limited ti 3-minutes or 1GB, and photos are limited to 200MB each. But it comes with seamless integration to your iOS and Android devices (these remain private unless you want to make them public), and includes a slick web app with a built-in image editor. Also on the fun side, you can then turn your photos in phonebooks or canvas-printed wall art (though it’s a shame they don’t offer things like calendars and Christmas ornaments). Lastly, Flickr is extremely useful for sharing your work with others, and the web app makes it really easy to download original resolution files if you need them for a graphic, etc. On the flip side of the equation, if you don’t step up to the Pro version for $49.99/year, you’re going to see ads. A lot of them. Every two or three pictures on your photo stream as well as while generally browsing. My other question is one of sustainability. How long can they maintain “free” for most users? And, should you need more than 1TB of photo storage, pricing ramps up dramatically to somewhere in the neighborhood of $299/year for 2TB. Google Photos, part of Google Drive, is interesting because they allow an unlimited number of photos smaller than 2048px wide (and videos shorter than 15-minutes), while then providing a free 15GB for larger files and documents. Google Drive seamlessly integrates with Android devices, Gmail, YouTube, and Google. This cohesion makes Google Photos one of the easiest platforms to navigate and a must-consider for anyone in the Google ecosystem. In fact, it all looks a little bit like gmail, except with Google drive, depending on how much storage capacity you’ve rented, you can actually upload files up to 5TB in size. Yeah, that’s right… TERAbytes! And, Google Drive is for any file type, not simply photos and videos. On the downside, Google Drive isn’t really for displaying pictures, in a portfolio sense, directly with your friends, family, and colleagues. Yeah, you can share to social media platforms, but Drive is a more basic storage system rather than store-and-share. Either way, there’s very little to complain about here. Microsoft OneDrive is a storage solution that can be approached from two different directions. If you’re looking for Photo storage, you start with 15GB for free PLUS 15GB extra if you turn on auto-upload from your iOS, Android, or Windows phone. That’s a lot of free pictures. But, if you step up to $6.99/month, Microsoft tosses in 1TB of storage PLUS Office 365, which includes Word, Excel, and PowerPoint for your smartphone, tablet, PC, or Mac. What makes that a good deal is that if you were someone simply looking for a word processor, Office 365 costs $6.99/month regardless. So it’s really up to you. Free for some files, or spend $6.99/month to get all the storage you need plus access to the world’s most popular productivity apps. It’s well worth your consideration particularly if you own multiple Microsoft-powered products. On the downside, OneDrive, much like Amazon or Google, offers fairly basic photo features and display options. Consider this service more storage than a photography portfolio. No way to download the original high resolution files. Shutterfly is essentially a photo-crafting website. Upload files and turn them into things like posters, photo books, wall-art, coffee mugs, calendars, Christmas ornaments, etc. It offers both pre-configured designs as well as customizable layouts. The custom layouts are a little tricky to operate because the online web app is a little sluggish on more complicated projects. And, the real bummer for Shutterfly is that, while the products are delivered with your high resolution images intact, there’s no way to re-download the original files. In that sense, Shutterfly is a terrible, horrible, no-good place to store and backup important memories. However, I felt it warranted mention for two reasons: one, as a warning for folks who wanted to use Shutterfly for storage, and two, because it really does offer a number of fantastic options for printing photos as well as turning them into crafts and keepsakes. They offer a great service; just not one with flexible storage. SmugMug offers a tremendous value, clean design, and excellent customer service. The opposite Amazon, Google, and Microsoft, SmugMug is less file storage and more an online portfolio and storefront for all your digital memories and creations. For as little as $40/year, upload as many photos and videos as you’d like — that’s right, unlimited. The only constraints are still images cannot be more than 50MB per file (so no ultra-large panoramas), and video files are limited to the 1080p resolution with a 3GB size or 20-minute length. Still, that’s a lot of bang for you buck. And, much like Shutterfly, SmugMug offers a range of services to turn photographs into greeting cards, photo books, and much, much more. This service also gets extra points for excellent customer service and being a family-owned business, not a division of an international media conglomerate. These folks care about keeping your memories safe, while offering tools for photographers looking to turn pro. Create customized digital portfolios and, in the costlier pricing tiers, make specific portfolios for specific customers, sell your work online in multiple currencies, or even customize your pricing list… all for less than the price of one annual new hard drive purchase. After diving into the world of Photo Storage (and Sharing and Printing), different photographers are going to have different needs and, therefore, preferences for a photo storage services. For our money, if you’re looking to not only store photos and videos, but also backup all of your digital files, Dropbox is definitely the way to go. Seamless integration at an affordable price. If you’re looking to take your photography to the next level and don’t have a plethora of other file types, SmugMug offers an excellent value for all sorts of photographers looking to display work online. While we might admire Dropbox and SmugMug for the value they each present to customers of all sorts, the true takeaway in the digital world is not to pick one backup system, but to use multiple systems. 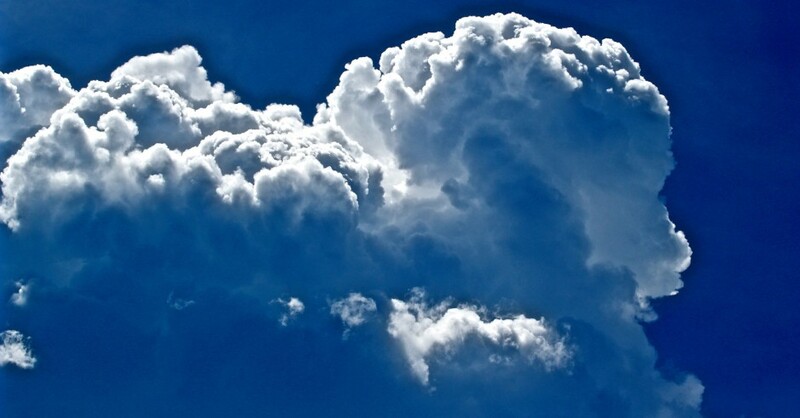 The Cloud is a relatively new frontier for public photo storage. Many of the best services as recently as two years ago have gone out of business. So why worry about losing your precious memories when, for relatively little money, you can preserve still photographs and videos in multiple places? When it comes to digital storage, either on your personal network or in the cloud, always expect the worst. And when you’re done with that, back it all up again. Sony RX100 VI: Sample Images, ISO Testing, Picture Effects, & More! I caught a deal a year ago, free 1TB storage from cloud.mail.ru. A look for providers located out of the US is worth the hassle. Thanks for the tip, George. Yaa, same here, I have been using their service for 6 moths and wonderful service. Own FTP is best service before cloud.mail.ru’s service .